For year-round programming at TIFF Bell Lightbox. Prices do not apply to The Toronto International Film Festival. Get tickets by browsing our calendar, calling 1-888-599-8433 or visiting the Steve & Rashmi Gupta Box Office. TIFF prefers Visa. *	* Children under 3 are free. Prices include HST and a $1 service fees for non-member priced tickets. Organizing a group of 20+ people to see a film? Talk to the Box Office or email us at groupsales@tiff.net to receive discounted rates. 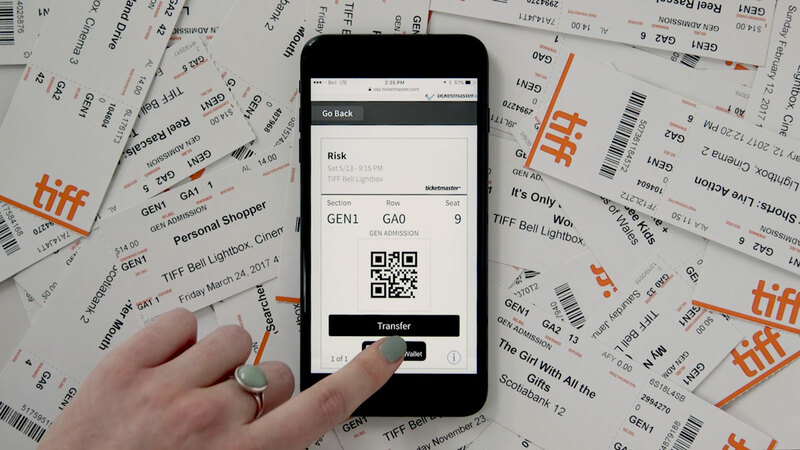 Did you know that if you have purchased tickets to a TIFF film or event, you can use your phone or mobile device to get into the cinema, instead of a printed ticket? We get a lot of questions about how the process works, so we put together a quick guide. All sales are final. Refunds are not permitted. Tickets are valid only for the screenings or events for which they are issued and cannot be replaced if lost or stolen. Seating is guaranteed until 15 minutes before the scheduled start of the screening or event. Latecomers will be seated at the discretion of venue staff. There will be no further admission 10 minutes after the start of the screening or event. Tickets may not be resold. Tickets may not be used as prizes or giveaways in contests, or for fundraising, promotional, or advertising purposes, without the express written consent of Toronto International Film Festival Inc (“TIFF Inc.”). Such use or resale will invalidate the tickets. Please check tiff.net regularly to see if there have been any changes or cancellations to screenings or events. If contact details have been provided at the time of purchase, ticketing service agents will attempt to notify ticket holders of changes or cancellations in advance. For screenings or events with a rating of 18A or above, proof of age by government-issued identification will be required prior to admission for persons that appear to be under the age of 18. Each person in attendance must have a ticket. TIFF Inc. reserves the right to refuse admission to, expel from the premises, and/or seize or cancel the ticket of, in each case without refund, any person who violates these conditions or whose conduct is deemed objectionable. Cameras and recording/transmission devices are strictly prohibited during screenings and in the galleries. It is illegal to film TIFF Inc. properties without the permission of TIFF Inc., or to make a copy of a film without the permission of the copyright owner. By using this ticket, the ticket holder agrees to being photographed, filmed, or recorded in the venue, and to the publication, reproduction, sale, license, distribution, broadcast, and other use of all photographs, video, or other recordings of the ticket holder’s voice or likeness, without further notice or compensation, for any purpose. By using this ticket, the user waives and releases TIFF Inc. from all claims he/she may have against TIFF Inc. for any loss, damage, injury, liability, or expense he/she may suffer arising from or connected to his/her presence at TIFF Bell Lightbox or the event venue due to any reason whatsoever, including those arising from or connected to personal injury, property loss/damage, invasion of privacy, defamation, or death. Visit tiff.net/tickets for complete Ticket and Venue Policies. Ticket packages offer the best value — and the best chance to get your first choice of films. Remember: TIFF Members choose their films first. Join today from just $99! Customize your Festival experience. Select your films starting August 25 (TIFF Members, according to level, followed by the public on August 27). The more you buy, the more you save. Buy in bulk and save up to 28% per ticket! Sample what Festival has to offer with a starter pack of six films. Book your time off now. Choose from weekday screenings starting at 5pm or earlier. Redeem your pack before individual ticket day! Great savings come to those who wait. Choose from films screening September 11–15. Redeem your pack before individual ticket day! Rush tickets are $25 (Regular) and $45 (Premium), when available. Evening screenings start after 5pm. Daytime screenings start at 5pm or earlier. Please note you may be asked to show ID at the box office or screening venue to verify age. Published by TIFF, this 400+ page book features Festival programmers' notes on each film. Pre-order with your ticket packages or buy in person at TIFF Shop or the Festival Box Office. Ticket packages go on sale to the public on June 19 at 10am (May 22 for Contributors Circle Members and up, May 29 for Members 365 (and up), and June 12 for Visa cardholders). Individual tickets go on sale to the public on September 2 at 10am (August 22 for Patrons Circle Members, Augus 31 for all other Member levels, and September 1 to TIFF Insiders). How do I get the best price on tickets? The earlier you buy, the better! Ticket packages are always your best bet to save. A 6-ticket flex pack works out to $25.83/ticket compared to an individual ticket that starts at $19. The larger the flex pack, the bigger the savings (50+ packs are under $21 per ticket). For even better savings, check out the Weekday Daytime or Back-Half pack to save over 35% off the price on an individual ticket. If you are buying individual tickets, your best savings come when buying earlier. Evening and weekend regular screenings start at $19 and premium screenings start at $26. Special pricing for weekday daytime screenings returns this year, starting at $19 for adults and $11 for anyone 25 and under. Remember to buy early to get the best price, as prices can increase by $2-$7 from the base price as demand for a film goes up. Remember, TIFF Members get to pick their films first (based on level). Become a Member today for just $99. How do I pick up my tickets or Programme Book once I’ve purchased? Print your tickets at home or save to your mobile phone from a link in your confirmation email or by logging into your account at tiff.net. You can also pick up tickets from the venue box office on the day of the screening. The venue box offices open one hour prior to the start of the first screening of the day and close 30 minutes after the start of the last screening of the day. How can I avoid lineups? Lining up is part of the Festival experience. Lineups outside of venues are usually made up of ticket-holders waiting to get into screenings. Because assigned seating is only available for screenings at Roy Thomson Hall, Visa Screening Room at the Princess of Wales Theatre, Elgin Theatre, and Winter Garden Theatre, people choose to line up early at general admission venues to get their preferred seating. We recommend showing up one hour prior to your screening (30 minutes at these venues). Audiences are let in no more than 30 minutes before the screening start time. People may also be waiting in the Rush line if they have not purchased tickets in advance and there are no tickets available for purchase (off-sale). Purchasing in advance is advisable. What time should I arrive at the venue to pick up my tickets and get a seat? We encourage everyone to get their tickets by printing at home or downloading to mobile. We recommend showing up one hour prior to your screening (30 minutes for Roy Thomson Hall, Visa Screening Room at the Princess of Wales Theatre, Elgin Theatre, and Winter Garden Theatre where there is assigned seating). Seating is only guaranteed 15 minutes prior to the scheduled start of the screening. Latecomers will be admitted at the discretion of the venue staff. What if the film I want to see is off-sale? That doesn't mean you can't get tickets! If the film you want is currently off-sale, continue to check back as inventory can fluctuate. A minimal number of tickets are reserved to honour commitments to TIFF sponsors and partners. If these tickets are returned to TIFF, they will be made available for public sale. Available tickets are released each day at 8am during the Festival, so be sure to check back. If you can't purchase tickets to the film you'd like to see, you can always Rush. All films at the Festival have been rated by the Ontario Film Review Board. Look for films tagged as TIFF Next Wave for titles of interest to audiences under 25, as selected by our youth-driven TIFF Next Wave Committee. Individual daytime tickets for anyone 25 and under have special pricing. Is there a limit to the number of tickets I can purchase? What if I'm attending with a large group? In order to ensure a fair distribution of tickets during the Festival, each account may only purchase a maximum of four tickets per screening. Do you have a companion seating policy? We do! Should you require companion or accessible seating, please contact the Box Office in advance at 416-599-8433. How can I get a copy of the Festival Programme Book? The Festival Programme Book and all merchandise are available at TIFF Shop beginning August 20. You may pre-order the Programme Book with your ticket packages starting on June 19 (May 22 for Contributors Circle Members and up, May 29 for Members 365, and June 12 for Visa cardholders). The Programme Book is $47 ($122 with delivery), which includes taxes and fees. How do I become a TIFF Member? TIFF Membership is open to everyone! Starting at $99, TIFF Members enjoy the very best in film programming, exhibitions, special events and festivals, and are part our efforts for a more engaged, connected, and informed world through the power of film. TIFF Members save with early bird pricing on ticket packages during their exclusive pre-sale and — new this year — all Members get to pick their package films before non-Members and get an individual ticket pre-sale on August 31! Learn more about TIFF Membership and how to join at tiff.net/join. How can I find out about any changes to my screening? Check tiff.net/changes after August 20 for information about any moved, added or changed screenings. Will fees be added to my order? Not when you buy Festival tickets or packages on tiff.net or at a TIFF box office. All service fees and taxes are included in the prices you see above. If you purchase individual tickets on ticketmaster.ca (instead of logging on through tiff.net), you will be charged a $1 fee per transaction. All sales are final; refunds or cancellations are not permitted. Tickets are valid only for the event for which they are issued, and cannot be replaced if lost or stolen. You can exchange tickets beginning September 4 at 8am for free online in your TIFF Account. Exchange tickets in person at the venue box office or over the phone, up until two hours prior to the start of your screening, for $2.50 per ticket. Please note there are no exchanges for Buzz List package or Closing Night tickets. TIFF prefers Visa, but we accept all major credit cards. Debit and cash are accepted for in-person purchases. Rush ticket purchases are cash-only at each venue. What's the process for package film selection? We'll send you an email with an assigned start-time to select your tickets on August 19. We go to great lengths to ensure a fair process to fulfill film requests. Our ticketing system randomly assigns windows to all flex-pack buyers, with an earlier window for TIFF Members. If you have purchased multiple packs, you will receive one login and ticket selection start time. You can log in with your package code and select tickets anytime between your start time and 10pm on August 29. If you do not select your films within this time period, you can log back in between September 4 at 8am and the end of the Festival to select your films. We strongly recommend that you have your ticket options ready before you log in at tiff.net during your assigned window, as you will have limited time to make your selections. What if I'm not available for the start time I am assigned? The best ticket availability will be at your start time, but you can make ticket selections any time until 10pm on August 29, or between September 4 and 15. If you are not available to your make your selections at your designated start time, a friend can select your tickets on your behalf. You will need to give them your login and package code for them to make your selections. Do I have to make all my ticket selections at one time? Can I go back into the system later? You will need to make all of your selections in one session. The session will timeout after one hour and any tickets remaining in your shopping cart at that time will be released. If you have only selected a few of your available tickets upon checkout, you will need to select vouchers for the remaining tickets in your package, which you can redeem beginning September 4. Premium: These events offer a premium in-person experience, and can include red-carpet screenings, World or North American premieres, and/or audience Q&As. Rush: A "Rush" lineup will be indicated at each venue for all non-ticket-holders looking for last-minute tickets. Tickets will be sold to the Rush line approximately 10 minutes before the start of the screening based on availability. There is a limit of one ticket per person. Please arrive as soon as possible to join the Rush line. Customers are limited to holding space in the Rush line for themselves and one other person. Please inform venue staff if you are holding a spot for another person. Rush tickets are $25 for regular screenings and $45 for premium screenings (cash only). Free: Indicates a free ticketed event. Free tickets can be reserved online starting September 3 (September 1 for TIFF Members) for the TIFF Cinematheque programme, while quantities last. Free tickets for the September 16 screenings of the Grolsch People's Choice Award winner and Toronto Platform Prize winner will be issued at the venue two hours prior to the screening. Off Sale: "Off-sale" means there is currently no inventory available for that event. An event may alternate several times between on-sale and off-sale before the event date as sales and internal partner commitments fluctuate. Your best option for off-sale events is to check again at tiff.net, by phone, or at the Festival Box Office as tickets are released at 8am daily. Vouchers: Complimentary ticket vouchers are not tickets, and must be exchanged for a ticket at the Venue or your Festival Box Office. Complimentary ticket vouchers can be exchanged from September 5 onwards, subject to availability. Member pre-sale: An advanced window when TIFF Members can purchase packages or tickets before the public. Become a Member today! Visa pre-sale: An advanced window when Visa cardholders can purchase packages before the public. Insiders Pre-sale: An advanced window when TIFF Insiders can purchase individual tickets before the public (but after TIFF Members). Become an insider by signing up for The Weekly e-newsletter, and you will be sent an access code in advance of the September 2 insiders pre-sale. Seating is only guaranteed until 15 minutes prior to the scheduled start of the screening. If late seating is disruptive, latecomers will not be admitted. Late seating is at the discretion of the venue staff. Our staff and volunteers are here to ensure the best possible Festival experience for all. TIFF Inc. will not tolerate mistreatment of any kind towards its staff or volunteers and will take measures accordingly. TIFF Inc. reserves the right to refuse admission and/or expel from the premises, without refund, any person whose presence or conduct is deemed objectionable. Rush tickets are subject to availability and are distributed on a first-come, first-served basis at the discretion of venue staff. Customers are limited to holding space in Rush lines for a maximum of two individuals, including themselves. Please inform the Festival staff managing the Rush line if you are holding a place for another individual. Please do not leave empty seats in the middle of the row at general admission houses; Rush seating is less disruptive to the audience if empty seats are available on the aisles. Seats cannot be saved. Due to venue fire codes, sitting in the aisles or standing at the back of the venue is not permitted. All cinema and lobby areas will be cleared following each screening. All films have been rated by the Ontario Film Review Board. Ticket-holders will be admitted to screenings in accordance with each film's classification. Please consult our film listing for ratings. Film runtimes, as listed in the Official Film Schedule and the Festival Programme Book, represent the best available information at press time. Runtimes are approximate and don't include time for intros or Q&As. Screenings and schedules are subject to change without notice. Check the Official Film Schedule for the most up-to-date information. All Festival venues are wheelchair accessible. If you require accessible or companion seating, or other accessibility services, please contact the Festival Box Office in advance by calling 416-599-8433 or 1-888-599-8433 (toll free) so that we can ensure your needs are met. All electronic devices must be silenced and stowed away during public screenings. Cameras and recording devices are strictly prohibited during screenings. Screenings will be monitored for unauthorized recording. It is illegal to make a copy of a film or part of a film without permission of the copyright owner. Toronto International Film Festival Inc. (TIFF Inc.) reserves the right to undertake anti-piracy measures and eject any person who is recording or photographing without authorization from TIFF Inc., to confiscate pirated material, and to report any unauthorized recording to law enforcement, which may subject that person to criminal and civil liability. TIFF Inc. reserves the right to film or record its events and activities for its own purposes. All media requests to shoot onstage activity must be pre-approved by the TIFF Communications Department. Screenings and events are subject to change without notice. Please check tiff.net/changes regularly to see if there have been any changes or cancellations. Tickets may not be resold. Tickets may not be used as prizes or contest giveaways, or for fundraising, promotional or advertising purposes, without express written consent from TIFF Inc. Such use or resale will invalidate tickets. By using a ticket to enter a Festival venue, the ticket-holder agrees to being photographed, filmed or recorded in the event venue, and to the publication, reproduction, sales use, distribution and broadcast of all photographs, video or other recordings of the ticket-holder's voice or likeness without further notice or compensation in any publicity, advertisement or other publication carried out by, or on behalf of, TIFF Inc. in perpetuity in any manner and media whatsoever, including print, broadcast or internet. By using a ticket to attend Festival screenings and events, the user waives and releases TIFF Inc. from all claims he/she may have against TIFF Inc. for any loss, damage, injury, liability or expense he/she may suffer, arising from his/her presence at the event venue due to any reason whatsoever, including those arising from personal injury, property loss/damage or death. If a Festival screening is cancelled or designated by our organization as a problematic presentation, tickets may be exchanged for another film or screening at TIFF’s discretion. Please visit your Festival Box Office or tiff.net to determine whether your ticket is eligible for an exchange. If you printed your ticket at home or had it saved to your mobile device, your ticket will automatically be exchanged for a voucher in your account by 10am the following morning. You can exchange this voucher for any screening ticket of equal or lesser value, subject to availability. You can do this online, over the phone, or in person. In-person exchanges can be facilitated in advance at the Festival Box Office, on the day of at the Venue Box Office, or to rush a film if there is no inventory available in advance. If you have a hard ticket to the disrupted screening, you can exchange this ticket for any screening of equal or lesser value, subject to availability. You can do this in person in advance at the Festival Box Office, on the day of at the Venue Box Office, or to rush a film if there is no inventory available in advance. Exchanges cannot be facilitated online or over the phone in this case. All ticket sales are final — we do not offer refunds. Any concerns should be directed to the Festival Box Office or customerrelations@tiff.net. Seating is only guaranteed until 15 minutes before the scheduled start of the screening. If late seating is disruptive, latecomers will not be admitted. Late seating is at the discretion of the venue staff. Our staff and volunteers are here to ensure the best possible Festival experience for all; TIFF Inc. will not tolerate mistreatment of any kind towards its staff or volunteers and will take measures accordingly. TIFF Inc. reserves the right to refuse admission and/​or expel from the premises, without refund, any person whose presence or conduct is deemed objectionable. Rush tickets are subject to availability and are distributed on a first-come, first-served basis at the discretion of venue staff. Customers are limited to holding space in Rush lines for themselves and one other person. Please inform the Festival staff managing the Rush line if you are holding a place for another individual. All electronic devices must be silenced and stowed away during public screenings. Bags are subject to inspection. By using a ticket to enter a Festival venue, the ticket-holder agrees to being photographed, filmed or recorded in the event venue, and to the publication, reproduction, sales use, distribution and broadcast of all photographs, video or other recordings of the ticket-holder's voice or likeness without further notice or compensation in any publicity, advertisement or other publication carried out by, or on behalf of, TIFF Inc. in perpetuity in any manner and media whatsoever, including print, broadcast or digital. By using a ticket to attend Festival screenings and events, the user waives and releases TIFF Inc. from all claims he/​she may have against TIFF Inc. for any loss, damage, injury, liability or expense he/​she may suffer, arising from his/​her presence at the event venue due to any reason whatsoever, including those arising from personal injury, property loss/​damage or death. Cameras and recording devices are strictly prohibited during screenings. Screenings will be monitored for unauthorized recording. It is illegal to make a copy of a film or part of a film without permission of the copyright owner. Toronto International Film Festival Inc. ("TIFF Inc.") reserves the right to undertake anti-piracy measures and eject any person who is recording or photographing without authorization from TIFF Inc., to confiscate pirated material, and to report any unauthorized recording to law enforcement, which may subject that person to criminal and civil liability. TIFF Inc. reserves the right to film or record its events and activities for its own purposes. Our staff and volunteers are here to ensure the best possible experience for all; TIFF Inc. will not tolerate mistreatment of any kind towards its staff or volunteers and will take measures accordingly. TIFF Inc. reserves the right to refuse admission and/or expel from the premises, without refund, any person whose presence or conduct is deemed objectionable. Standards for ratings of all of films and trailers screened at TIFF Bell Lightbox are set by the Ontario Film Authority (OFA). For film ratings, please consult the film listings on tiff.net. All questions and concerns regarding permanently rated titles can be directed to the OFA. A searchable list of titles can be found here. For titles whose certificates are not available through the OFA website, and for all TIFF Festival, TIFF Next Wave, TIFF Kids and Canada’s Top Ten ratings, please consult with the Steve & Rashmi Gupta Box Office, located at TIFF Bell Lightbox.